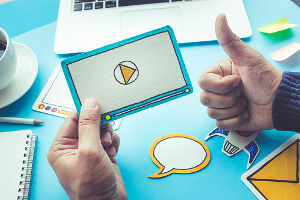 Effective B2B video marketing content can help firms tell compelling stories, showcase their expertise or company culture, and boost conversions. Video already dominates social media, and it’s becoming central to any marketing strategy. As we shared in our post on 2019 marketing trends, video content represents a majority share of internet traffic and is forecasted to grow to 82% of all internet traffic by 2021, according to Cisco’s annual Visual Network Index (VNI) forecast. It’s time to start considering how to incorporate video content into your marketing strategy if you haven’t already. We’ve outlined 7 ideas of ways you can leverage video to create excitement, build relationships and engage with clients and employees. Brand videos are thoughtful narratives of your firm’s story, mission, capabilities, and vision for the future. This format enables you to convey high-level vision in an engaging way and build brand awareness that hooks the audience and demonstrates your firm’s ambition and capabilities. Your customers are your best advocates. Video testimonials are a great sales tool because people influence other people, and your clients can endorse you throughout their networks and to your prospects. Asking a client to share their experience working with your firm is a powerful way to assure prospects of your capabilities and services and move them down the sales funnel. Similar to a client testimonial video, you can use video to highlight a successful project or relationship. A case study or testimonial video can feature various shareholders including employees and clients as well as the process that made the project a success. Instructional videos are one of the most common video formats in the B2B landscape. Similar to a webinar, with this single-focused video you can address a common issue that customers may have and use your expertise to demonstrate the optimal solution. One popular style is a how-to video. It serves as great thought leadership content and when optimized, will help with SEO and driving more traffic to your site. Another type of instructional video is an explainer, where you narrate a problem and solution to better explain why someone may need your product or service. Spotlight videos are short videos that feature an employee speaking about their experience working at a firm, their career growth path, or a specific aspect of the firm that they appreciate. This format creates a positive message about your employee culture that can be referenced by potential talent and clients. It’s also a perfect video format to share on social media, especially platforms that are best suited to feature your company culture like Instagram and Facebook. Live webinars give your clients the opportunity to watch and interact with your content in a longer format. You can demonstrate your expertise on a specific topic, accept questions from a live audience and give your perspective on the trends within the industry. Even if a potential user can’t join the webinar, a recorded webinar is available after the broadcast for users to view at their own pace. This is a great addition to your content marketing strategy and powerful component in establishing yourself as a thought leader in your industry. Vlogging is the combination of video plus blogging. It’s a cost-effective and creative way to bring a more visual and engaging format to your content marketing program. A vlog is a short, low-production video that typically features a subject matter expert talking to the camera while discussing a particular subject. The possibilities for vlogs are virtually endless, but some ideas include tutorials or “how to” videos, behind the scenes looks at a project or process, product demonstrations, explainer videos, tips and tricks and interviews. The videos can be shared on social media, as well as embedded on your firm’s blog with a transcript. As more firms invest in video marketing for all of their channels, you’ll need to create a consistent stream of content to ensure your firm stays on your customers’ radar. These examples will help you design a strategic video marketing plan that will engage, educate and entertain your prospective and current customers.